Fall is definitely in the air. I can stand outside and feel a slight coolness to the breeze, which I love. This is my favorite time of year. 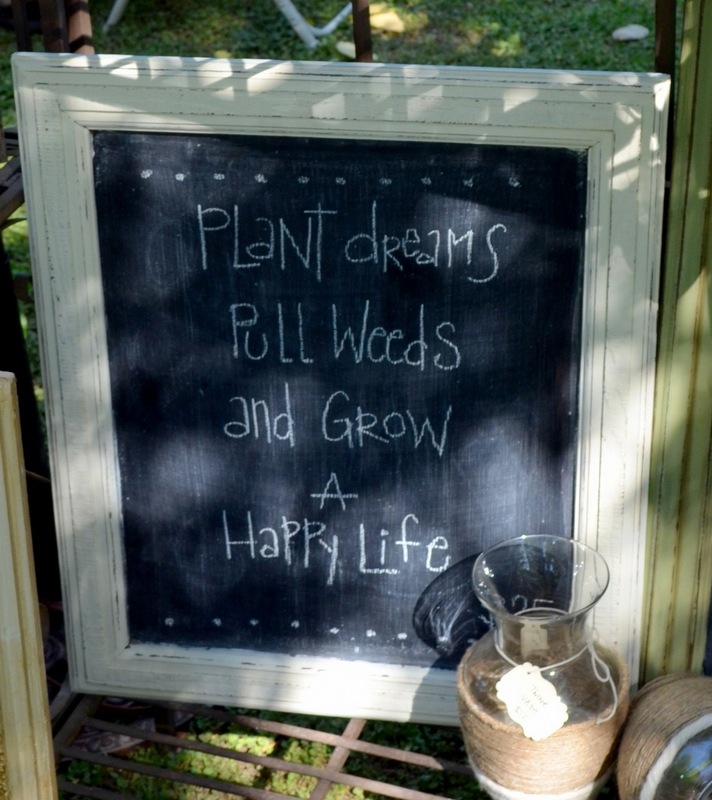 One of the many reasons is that it is time to get ready to plant my fall vegetable garden. One of my favorite vegetables to grow is lettuce. It is so nice to be able to step out into the garden and snip off fresh, delicious lettuce leaves for our dinner salad. To get a head start on my lettuce, I planted the seeds indoors. The reason is, is that lettuce seeds need temperatures below 80 degrees in order to germinate. After a few weeks growing indoors, I will be able to transplant them out into my garden. Growing lettuce is very easy and you don’t need many supplies to start them indoors. I used plastic food containers that I had been saving. Why don’t you join me and grow your own lettuce too? You don’t have to have a vegetable plot. Lettuce grows just fine in containers or even in a recyclable grocery bag. For how to start lettuce seeds indoors, check out my latest Birds & Blooms blog post – “Grow Your Own Lettuce in Recycled Containers”. I hope you will grow some lettuce with me! I love visiting other people’s gardens, particularly if they have fruit and vegetables growing in them. 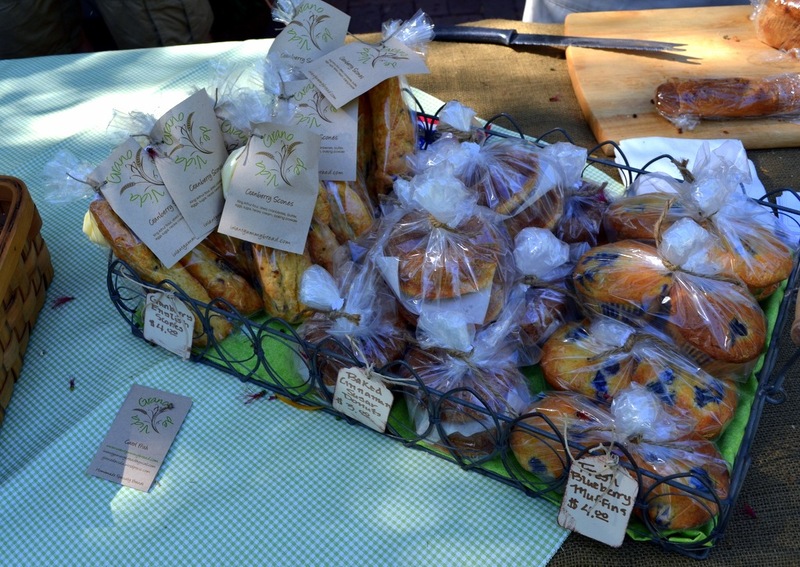 So, I was thrilled to be able to go on a tour of local ‘edible’ gardens earlier this month. 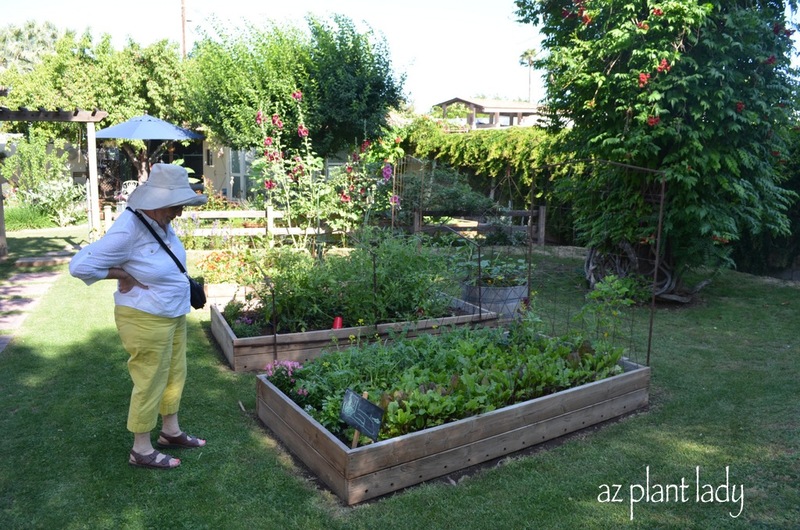 This is the second year of the Arcadia Edible Garden Tour, which is made up of a collection of residential gardens in the ‘Arcadia’ area in east Phoenix. I used to live in this area and it is one of my favorite regions of the Phoenix metro area. Because my mother loves gardening almost as much as I do, I decided to buy her a ticket too and take her with me as a Mother’s Day gift. Our first stop was to see Jill’s Sweet Life Garden. I made sure to visit there first because I had been following her blog and couldn’t wait to see her gardens in person. 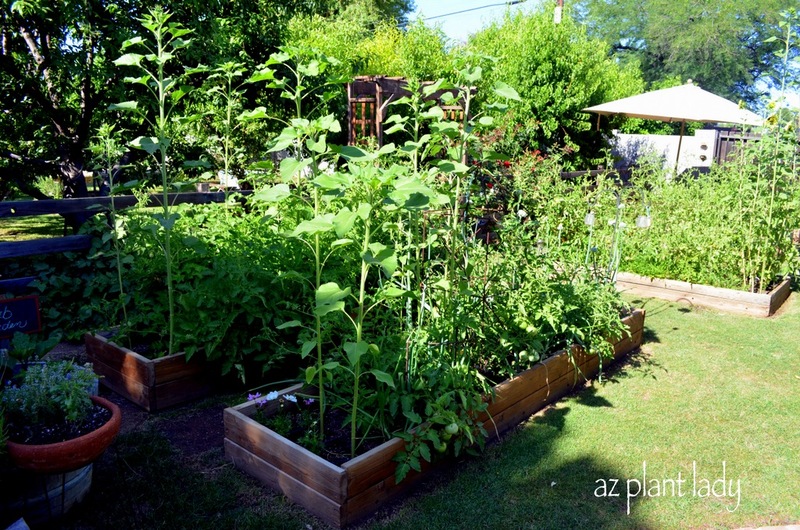 As we entered the garden, We headed straight for the raised vegetable beds. My mother and I love to grow leaf lettuce, so we had to see what varieties were being grown. One of the reasons that I was excited to go on this garden tour, was to get ideas to use in my own garden. 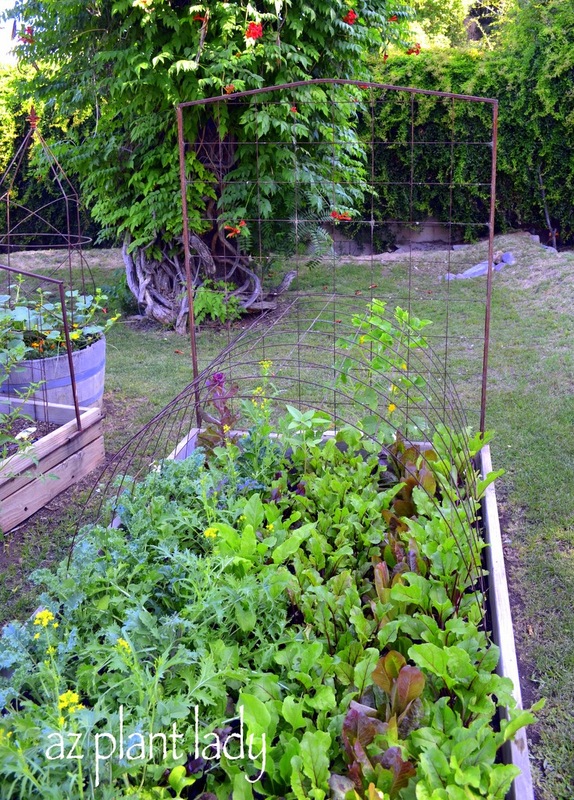 Like, using regular wire mesh over the garden. This would be great to use as a support for shade cloth in summer or frost cloth in the winter. It is much more attractive then PVC supports. 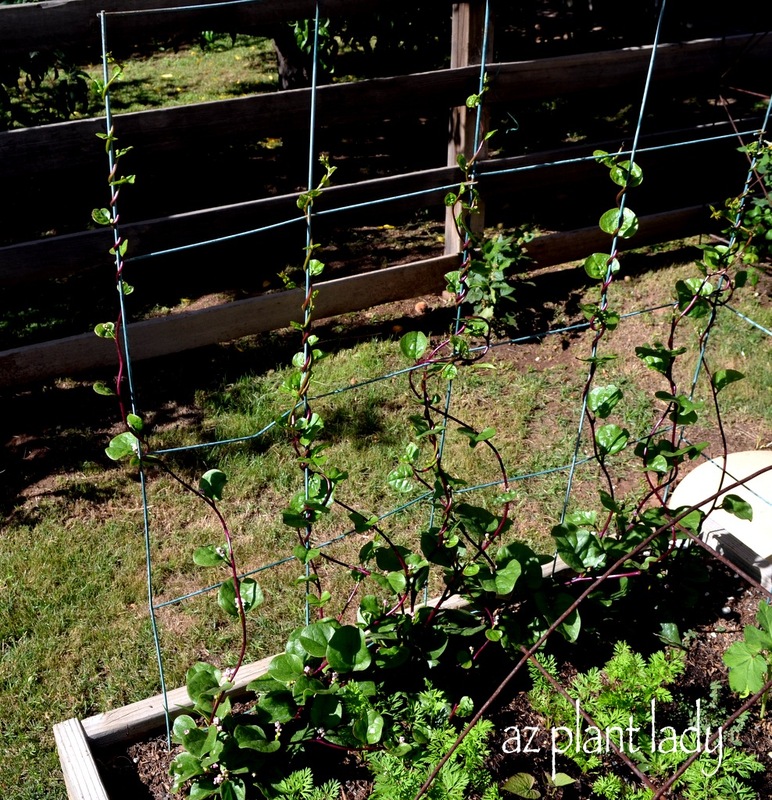 The trellis is made of rebar and wire mesh and provides an attractive support for vining vegetables. As many of you know, I love to grow nasturtiums alongside my vegetables. They aren’t only pretty, they help to keep bad bugs away from my veggies. This bed had a variety of nasturtium that I was anxious to try ‘Cherry Rose Jewel’ (I found seeds at Botanical Interests). I will definitely be planting these next year. 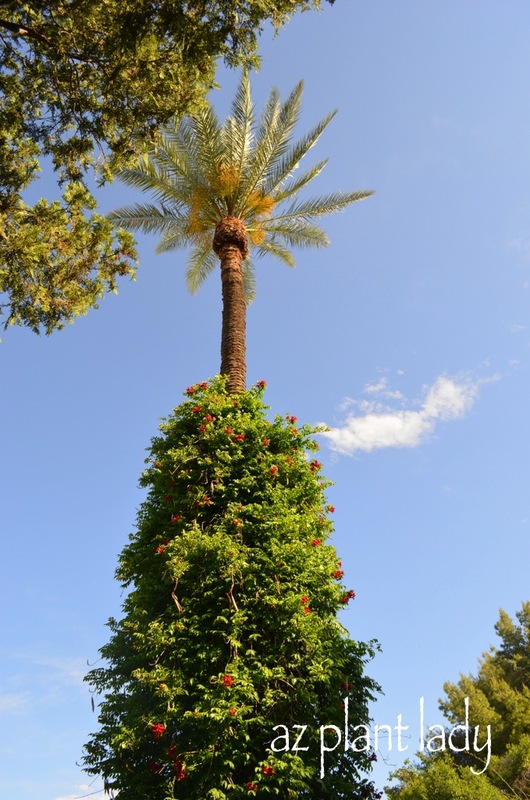 As I was busy admiring the raised beds, my attention was drawn upward by a massive trumpet vine that was growing up a Phoenix date palm. Talk about an unexpected support for a vine – I loved it. I have been growing a special variety of corn in a half wine barrel. 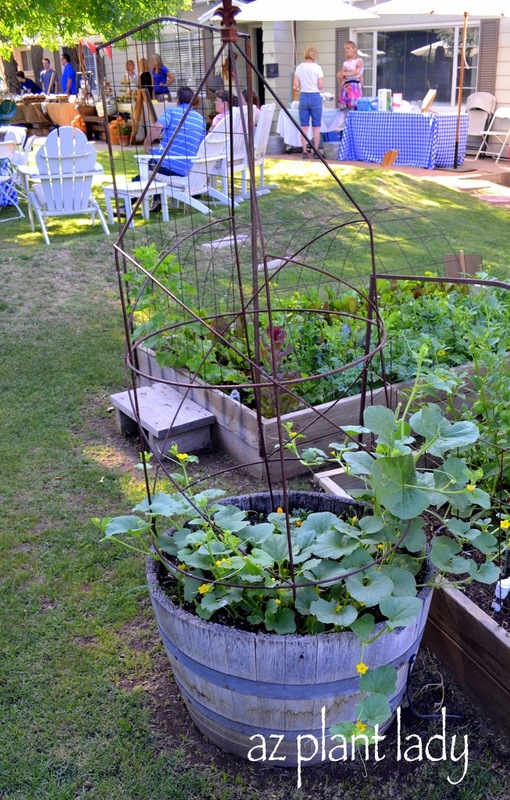 Sweet Life Garden had cucumbers growing in a barrel with a beautiful trellis. Baker’s Nursery had these wine barrel trellises available, but I’m not sure if they still do. You could certainly make your own. 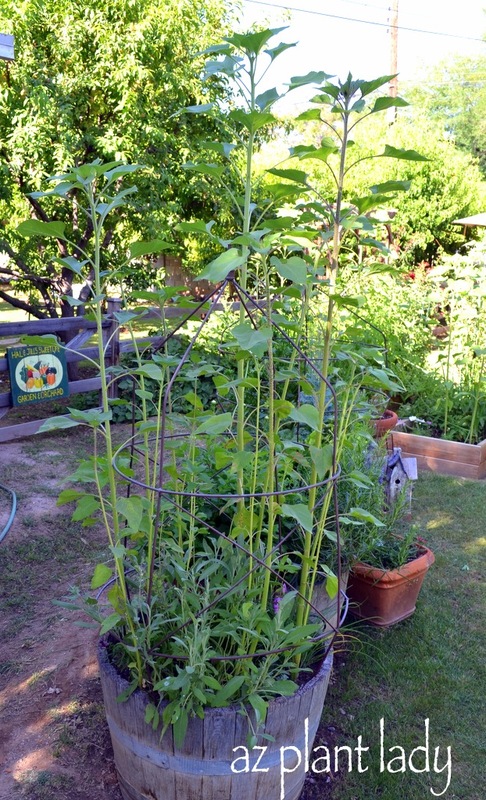 In addition to cucumbers, sunflowers were also growing in a barrel. I may have to try this. 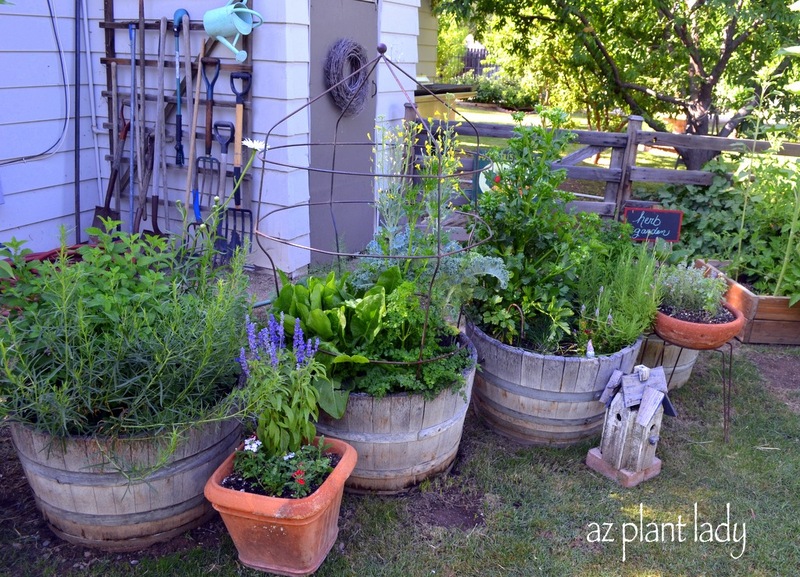 I love growing herbs in pots, but I think Jill’s look better then mine because of the half barrels. I think I need to get more for my garden. Tomatoes were growing like crazy with some beautiful heirloom varieties ripening. Wouldn’t this look beautiful on a sandwich or on a salad? I think it is important to have seating areas scattered throughout the garden, which invites you to sit and enjoy your surroundings. 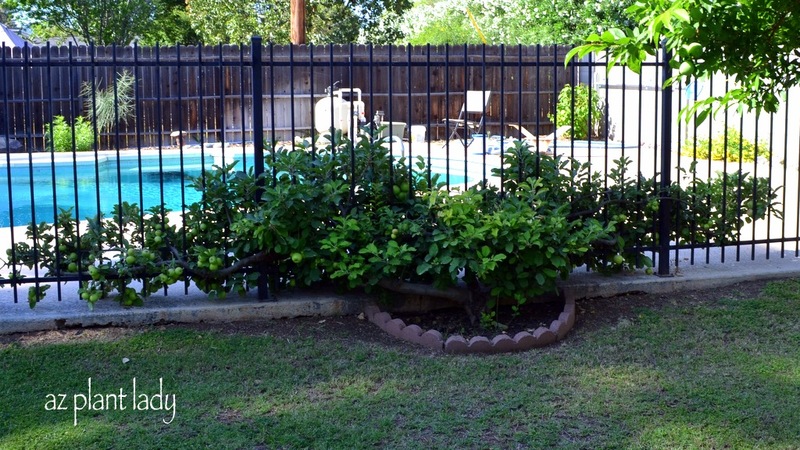 Here is another example of the wire mesh being used as a trellis. For those of you who mourn the fact that they cannot grow leafy greens for their salad in summer – let me introduce you to Malabar spinach. Okay, it’s not exactly a spinach but tastes great in salads and tastes like spinach when cooked. 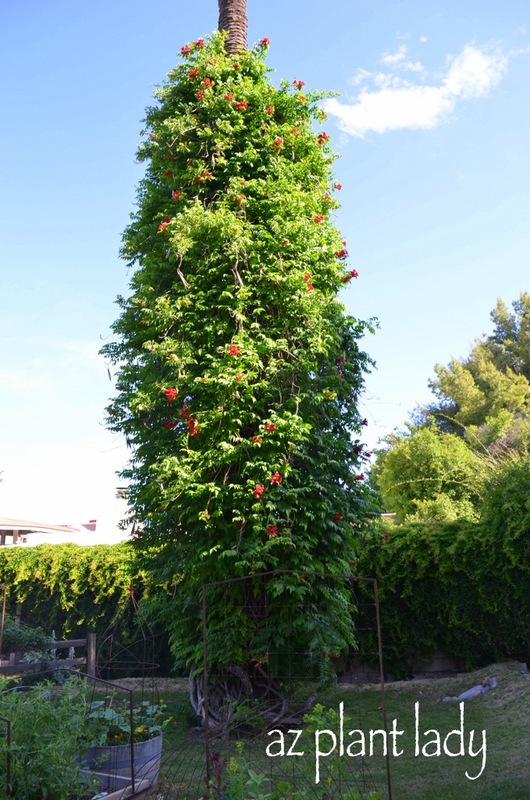 It loves hot temperatures and needs a trellis for support. I have seeds, but will probably wait until next year to plant mine. The seeds can be a little hard to find at your local nursery, but you can buy some through Amazon.com for under a $1 – just type in Malabar spinach in the search. Why limit yourself to growing just vegetables? 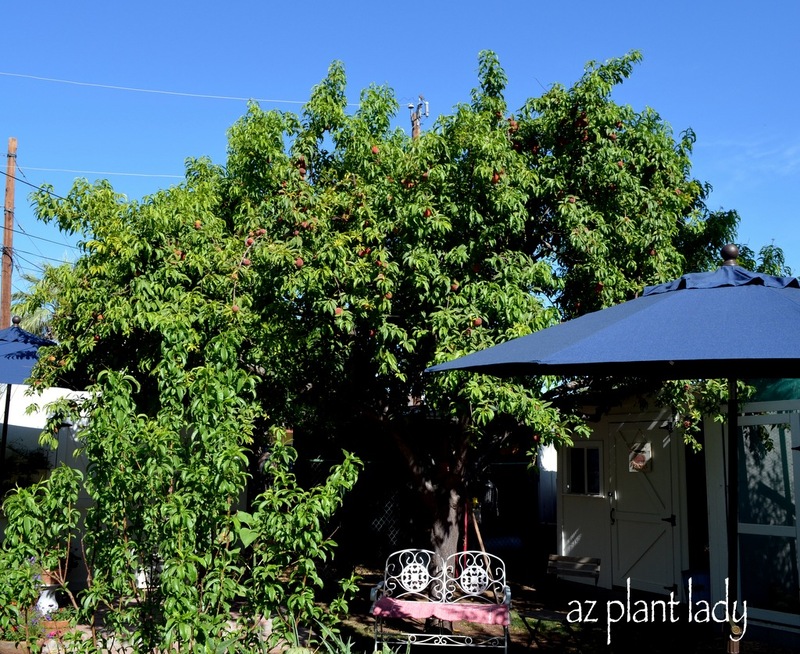 Fruit on shrubs and trees is also fun to grow as you can see from the large peach tree, above and the espaliered apple tree, below. I especially enjoyed seeing the peach orchard. I have been busy picking the blackberries off of my vines and have been thinking of adding more next winter. 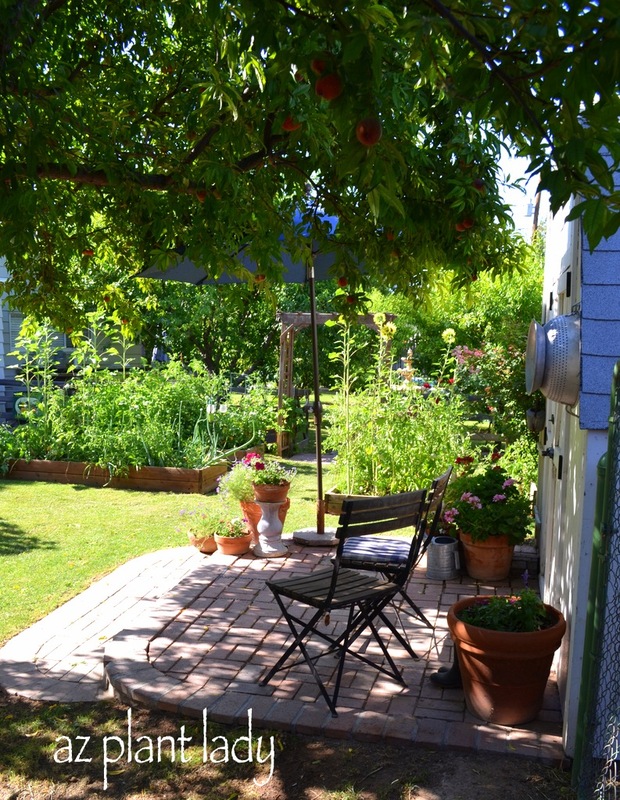 After seeing the berries at Sweet Life Garden, I will definitely add more to my own garden. Did you know that there is a thornless variety? I have one thorny blackberry bush and the rest are thornless. Guess which kind I like best? It was time to wrap up our visit because there were more gardens to visit. Did I mention that they have chickens too? 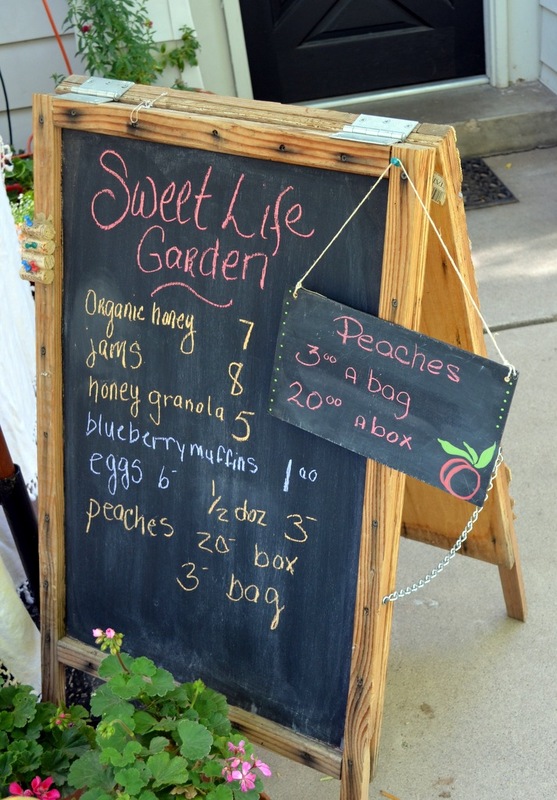 On our way out, we enjoyed seeing a variety of products offered by Sweet Life Garden and local vendors. 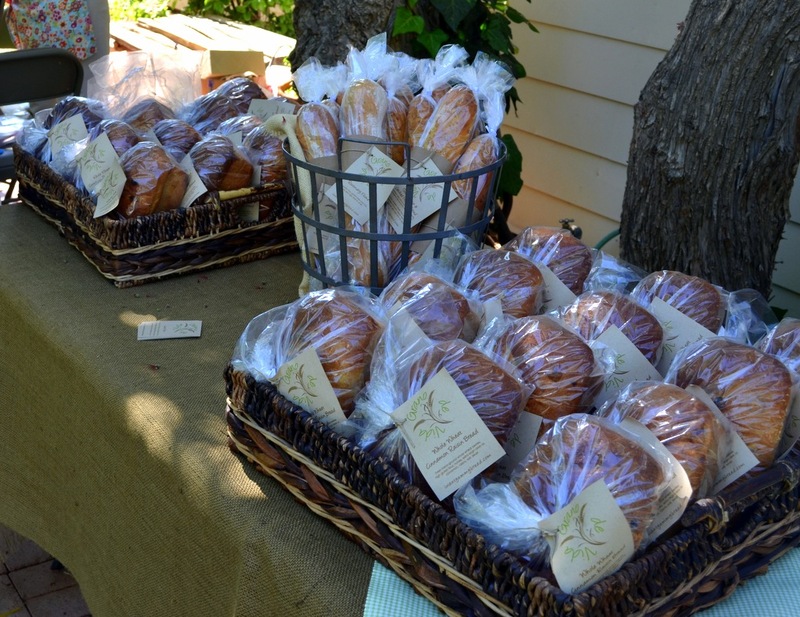 I had already eaten breakfast, but that didn’t stop me from enjoying a few samples. The three-cheese black pepper bread came home with me. We had a great time visiting Jill, at Sweet Life Garden. But, our adventure didn’t end there. There were more gardens to visit. I will give you the highlights of the other gardens in my next post. 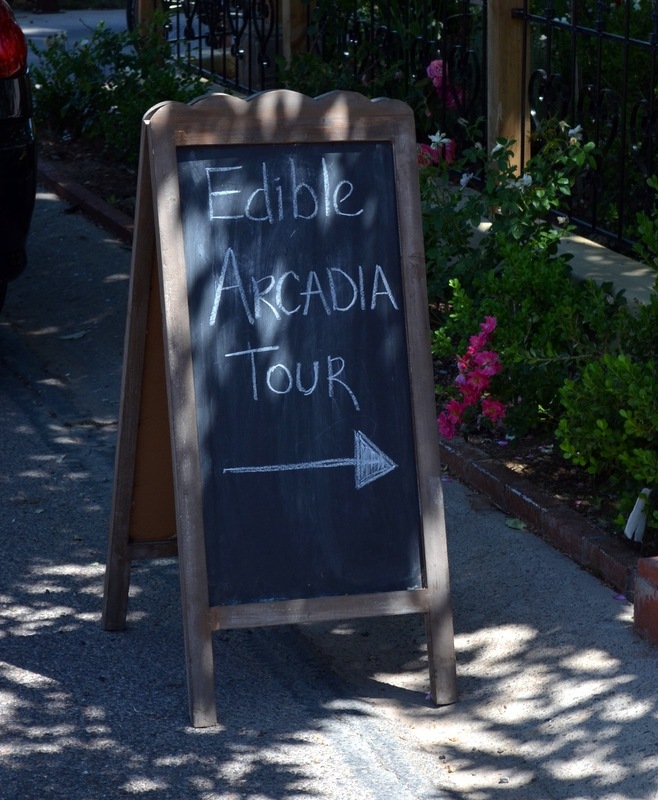 **You can find information about the Arcadia Edible Garden Tour on Jill’s blog, Sweet Life Garden. Be sure to order early next spring, when tickets are available. Today was a beautiful winter’s day. The temperature was a little above normal for this time of year. 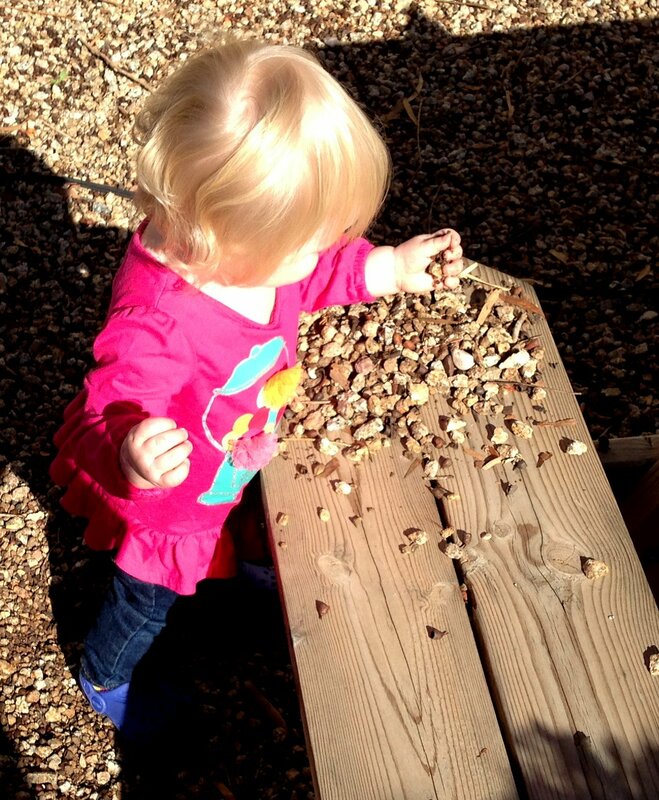 We spent time out in the garden today with our granddaughter, Lily. 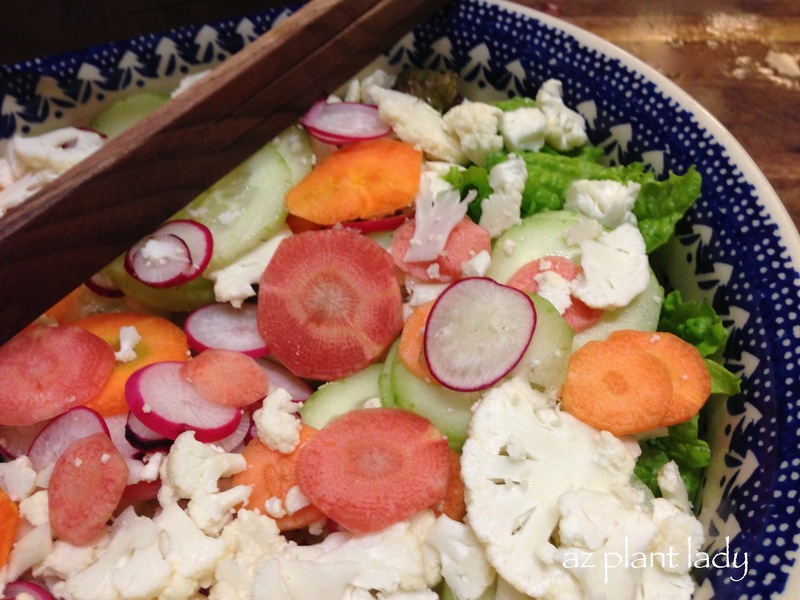 I spent time harvesting leaf lettuce, radishes, carrots and cauliflower for our dinner salad. I used our bounty to make a delicious salad for dinner. The only thing from the grocery store in our salad was the cucumbers, which aren’t in season until summer. She absolutely loves to pick up rocks. 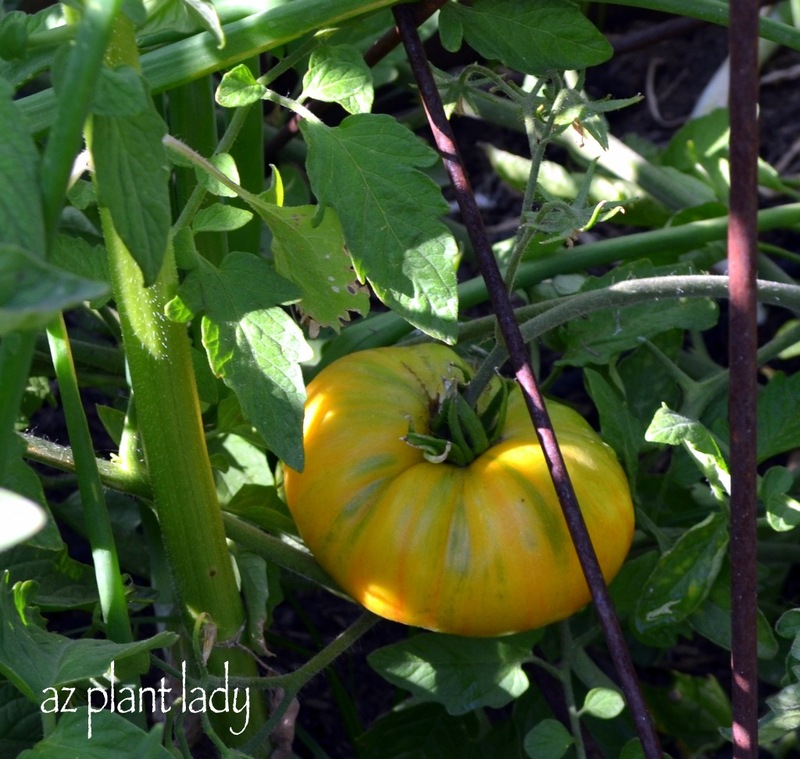 https://www.azplantlady.com/wp-content/uploads/2013/02/IMG_0642.jpg 444 640 arizonaplantlady@gmail.com http://www.azplantlady.com/wp-content/uploads/2018/10/favicon.png arizonaplantlady@gmail.com2013-02-07 03:47:002016-10-26 14:36:17Picking Vegetables or Rocks? What Am I Growing In A Grocery Bag? So what made me think of growing lettuce in a grocery bag? Well, it wasn’t my idea. I actually saw an article about it and thought it would be fun to try in my own garden and share with you. I took my recyclable grocery bag and made a few little holes on the bottom, using scissors, for drainage. Then I placed the bag where I wanted in the garden. It is hard to move after you fill it with soil. I filled the bag with planting mix and then planted my lettuce transplants. Of course, you can simply plant lettuce seeds instead. 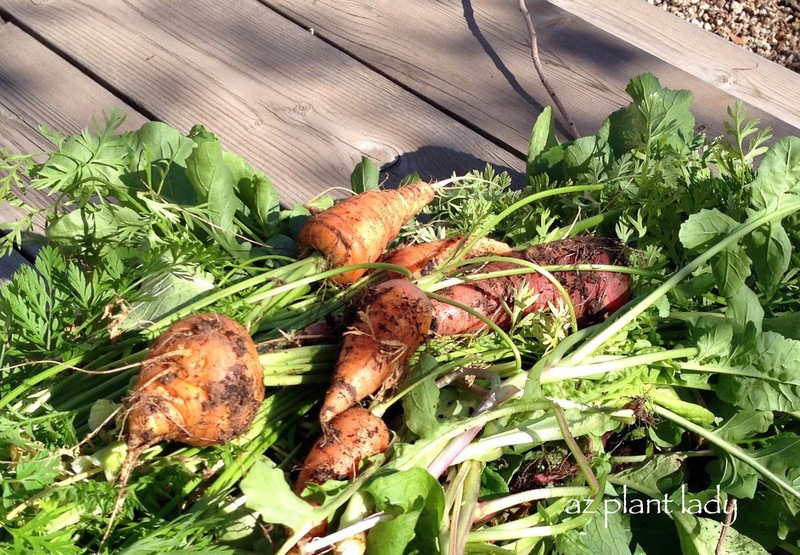 Add slow-release fertilizer because all vegetables need fertile soil. Then water. I simply put a drip emitter on my new lettuce planter. I love how it looks and just a few weeks after planting, I can already pick lettuce. So how about you? Is this something you would like to try? 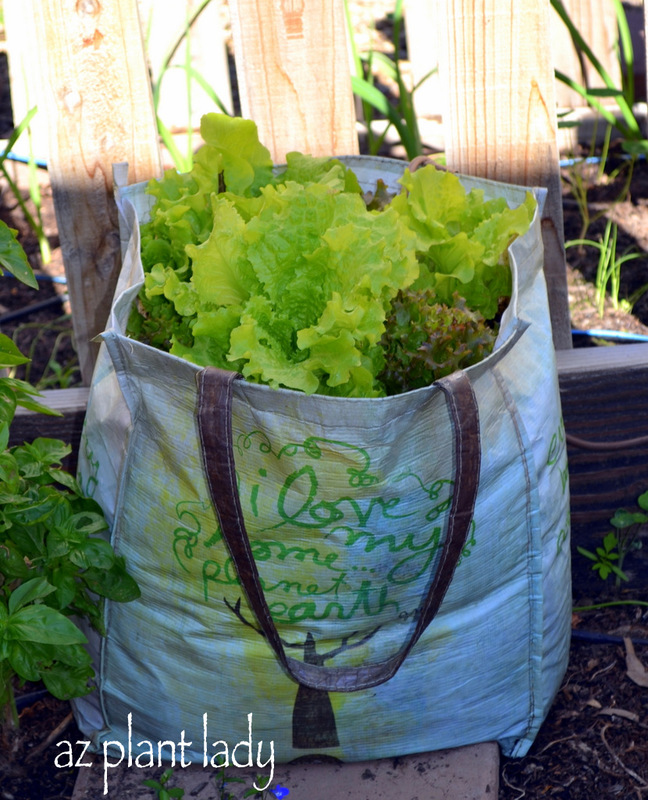 https://www.azplantlady.com/wp-content/uploads/2012/11/lettuce-growing-grocery-bag-002-1.jpg 640 519 arizonaplantlady@gmail.com http://www.azplantlady.com/wp-content/uploads/2018/10/favicon.png arizonaplantlady@gmail.com2012-11-06 16:30:002016-10-26 14:36:18What Am I Growing In A Grocery Bag? Oh, I have been imagining the bounty of vegetables that will come from my cool-season vegetable garden. I have visions of of harvesting lettuce, garlic, carrots, green onions, cauliflower, spinach and radishes fresh from the garden. Of course, I still have cucumbers, peppers, bush beans and tomato plants in the garden, which keep me busy. But, I can hardly wait to plant my cool-season vegetables. And so in a few weeks, I will add 3 inches of new compost and 1 inch of manure to my gardens, to get them ready for the seeds that I will plant. I prefer starting vegetables from seed, except for cauliflower & garlic. Cauliflower does best when started from transplants. I’ll plant my garlic in October from cloves (I still have about ten heads of garlic left from my spring harvest :-). I am putting my order in for my seeds now so that they will be ready to plant. 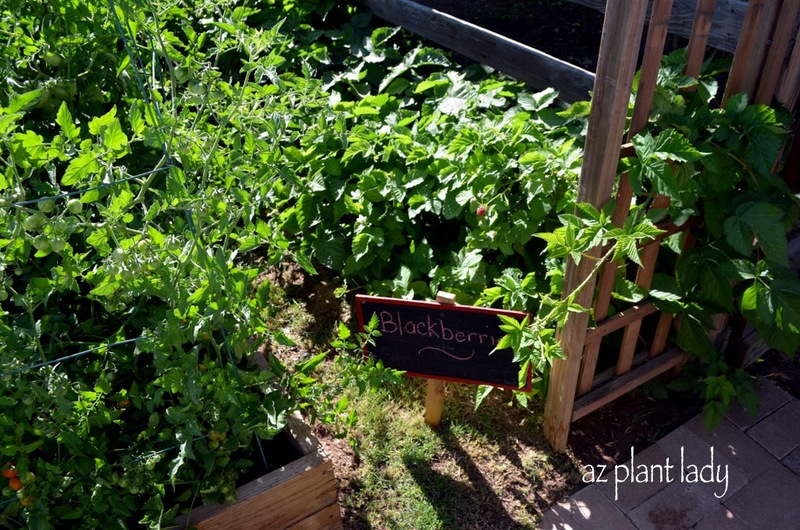 For information on what kind of vegetables to plant in your garden and when to plant them – check out this link (simply enter your zip code for a customized vegetable planting calendar). Danger In My Vegetable Garden…. Okay. It’s really happened to me. I had heard about what can happen when you grow your own vegetables from other gardeners, but I didn’t think too much about it until…. I discovered the danger of growing a vegetable garden. Oh, I know it looks quite innocent in the picture above. But, there is a real danger lurking there. Well you see, I have discovered the wonderful benefits of growing my own vegetables. I love their delicious, fresh taste. I enjoy saving money and passing by the produce section at the grocery store. Although I can grow vegetables all year long, unfortunately I cannot grow the same vegetables 12 months out of the year. I still look back to that late spring day when I harvested my first planting of garlic from my garden. We harvested quite a bit. We let it cure for a couple of weeks, then cut off the leafy tops and stored all that garlic in a cool, dry place out of the sun. Now, I love garlic and use it a lot for cooking. All I had to do when I needed some garlic was grab one from the bowl I was storing them in on a dark shelf. But, the other day when I went in there, there was no more garlic. Now, I have to buy it at the grocery store again. I never used to mind buying garlic from the store. But now, I sure do! The same thing happens when I have to start buying lettuce from the store in summer after enjoying my own homegrown lettuce the rest of the year. And it goes on and on with corn, broccoli, cucumbers, green onions, carrots and tomatoes. So, now do you see the danger of growing your own vegetables? I would like to thank you all for your kind comments regarding my recent “grandmotherhood”. I don’t know about you, but I hate having to buy lettuce to make salad with. Usually, I purchase the bagged lettuce because it is convenient and already cut up. What I really don’t like is the price for buying it this way. So, I have started buying lettuce and tearing it up myself. Last fall, winter and spring, I got very spoiled by being able to just step outside into the back garden and cutting some lettuce from my own garden. I had grown a mixture of all kinds of leaf lettuce and spinach. It was absolutely delicious too. It was very hard when the warm temperatures came and lettuce would not grow anymore. I have planted a lot of leaf lettuce and spinach in my vegetable garden and have lots of little seedlings coming up. 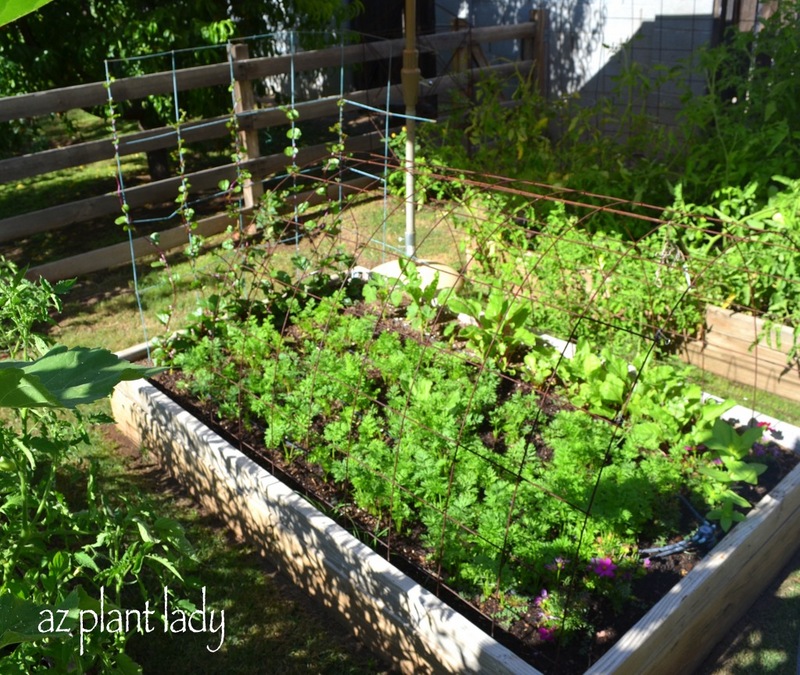 So, can you do if you want fresh lettuce and don’t have a vegetable garden? How about planting a salad bowl? I found these salad bowls for sale at a farmer’s market in North Carolina last year. It is really easy to make your own. 1. 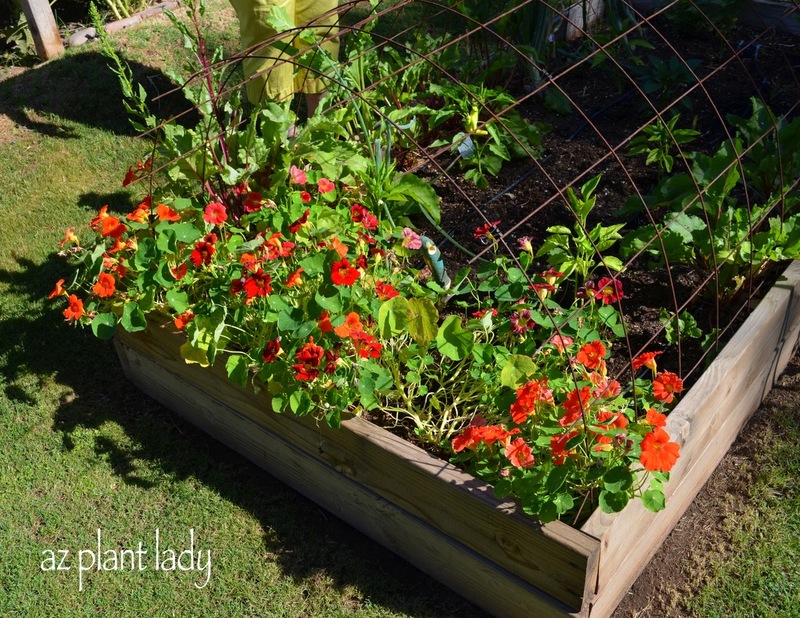 Choose a planter that is at least 8 inches deep (12 inches is best) with holes for drainage. 2. Fill with potting soil and wet the soil thoroughly. 3. Plant with lettuce seeds. I like leaf lettuce, but you can arugula, escarole and water cress. If you prefer, you can simply plant lettuce transplants, available at your local nursery. 4. 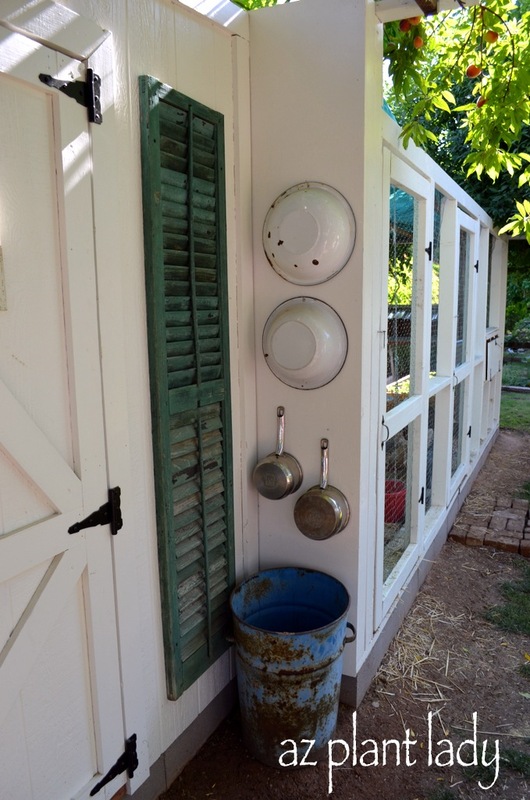 Put your container by a window that gets at least 6 – 8 hours of sun, but avoid the hot, afternoon sun. 5. Keep the soil moist by using a spray bottle filled with water. You will usually have to spray once a day. 6. Once the seeds germinate, back off on the watering, but don’t let the soil dry out. 7. Thin the seedlings to the recommended distance that your seed packet recommends and fertilize every 2 weeks using fertilizer at half strength. 8. Begin harvesting your leaf lettuce by simply snipping off the outer leaves. Your lettuce will continue to produce new leaves to replace those lost. Once your lettuce starts to ‘bolt’ (grow tall), it is time to pull it out and start over again. I hope you are all of to a good start this week. But, I must admit that my love for Mondays is rather new. I didn’t always enjoy sitting in traffic, headed for my office in downtown Phoenix, where I worked as a landscape designer. (I did enjoy my beautiful office that overlooked the city from the 14th floor). Fast forward to 5 years later, and I find Mondays refreshing. For one, the kids are back in school after a hectic weekend, trying to get their projects finished on time. I also love that Monday is a fresh start. 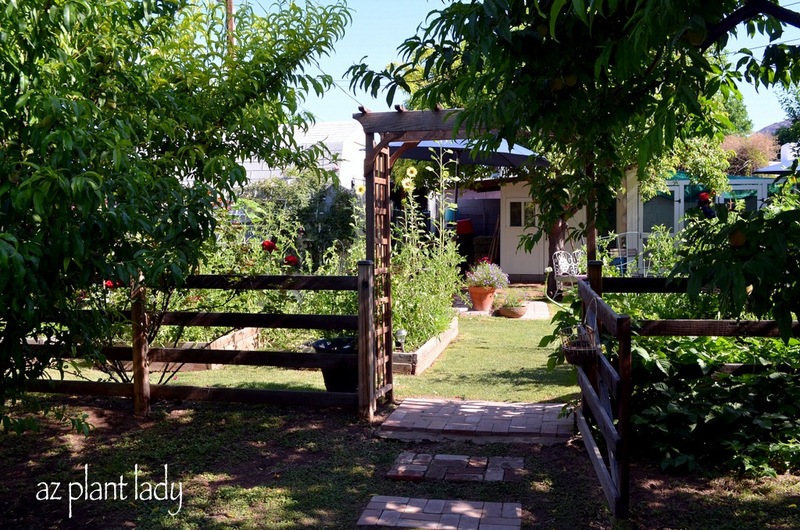 I rarely have time to garden on the weekends, so Mondays is a wonderful time to step outside and see what is flowering, smell the subtle fragrance of my desert trees and most importantly – see what has developed in my vegetable garden. Two weeks ago, I planted my fall vegetable garden – on a Monday. It all started with a visit to our local Home Depot, where I picked up bagged compost, aged steer manure, bone meal and blood meal. Earlier, we had ripped out what was left of our summer vegetable garden, leaving only our basil and oregano plants behind. Since I had removed the shade cloth from the garden, I put in two plastic chairs to protect the basil and oregano from the sun. We added a 3 inch layer of compost and 3 inches of aged steer manure. Then I sprinkled both blood and bone meal on top. We then lightly raked the layers together and then waited a week before planting our vegetable seeds. We placed stepping stones through the middle so that we will have easy access to our vegetables. I buy my seeds from different sources. I have Burpee, some from Botanical Interesta, but I usually buy mine at the local Big Box store. We decided to plant cucumbers, carrots, green onions, spinach, leaf lettuce and cauliflower. I let each of the kids pick out what kind of seed they wanted to plant. Gracie loves carrots, so that is what she picked to plant. My son, Kai, planted the green onions and my daughter, Ruthie, planted the lettuce. I finished up planting the rest of the seeds, using my top secret vegetable garden tool. I had planted the sweet corn a few weeks ago, since they need to be in the ground by the end of August for best results. So, do you know what you will be doing today? I will be stepping out in to my vegetable garden, seeing what seedlings have started to sprout. Stay tuned for how to plant garlic and learn about my ‘secret’ gardening tool. I hope you all had a great weekend and are off to a good start for the week. Please email me a photo of your bouquet, or leave me a link to your blog post with you bouquet in the comments section of this post. I will then feature your bouquet and a link back to your blog. Time To Plant Vegetables Already? Believe it or not, it is time to plant certain kinds of vegetables right now. Yes, I realize that it is August and it is hot and the last thing you probably want to do is have to plant seeds out in your vegetable garden. But, just keep telling yourself that by working a little bit now, you will reap the rewards of fresh vegetables in just a few months when the temperatures are cooler. So what seeds can you plant now? Here are some of my favorites…. 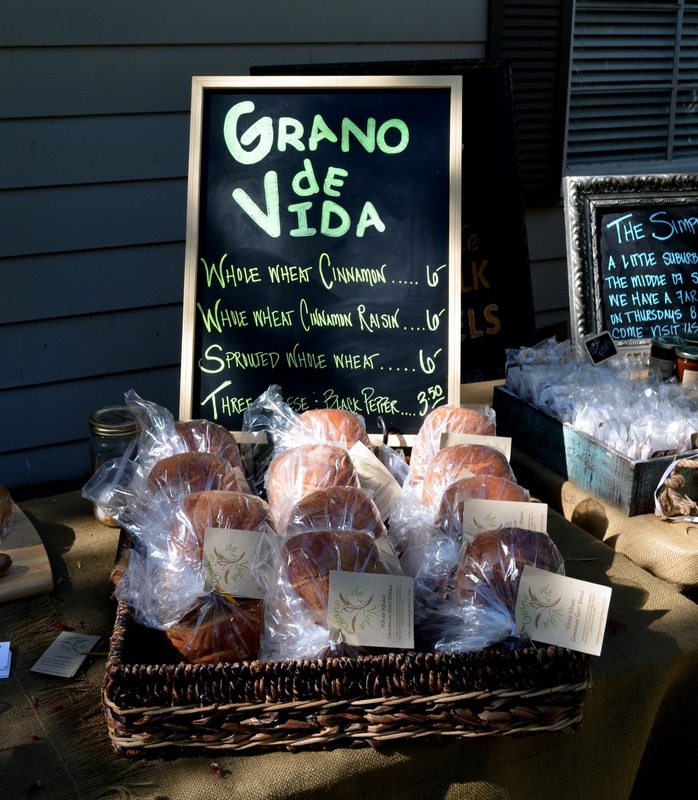 Yes, we can grow two crops of corn here in the desert – once in spring and in the fall. Aren’t we lucky? I think this is my favorite vegetable. I love going out in the garden with scissors and clipping our dinner salad. It’s important to remember to start these from seed when planting this time of year. However, if you prefer using transplants, you will need to wait until fall to plant. So, do you have any plans for planting vegetables soon? 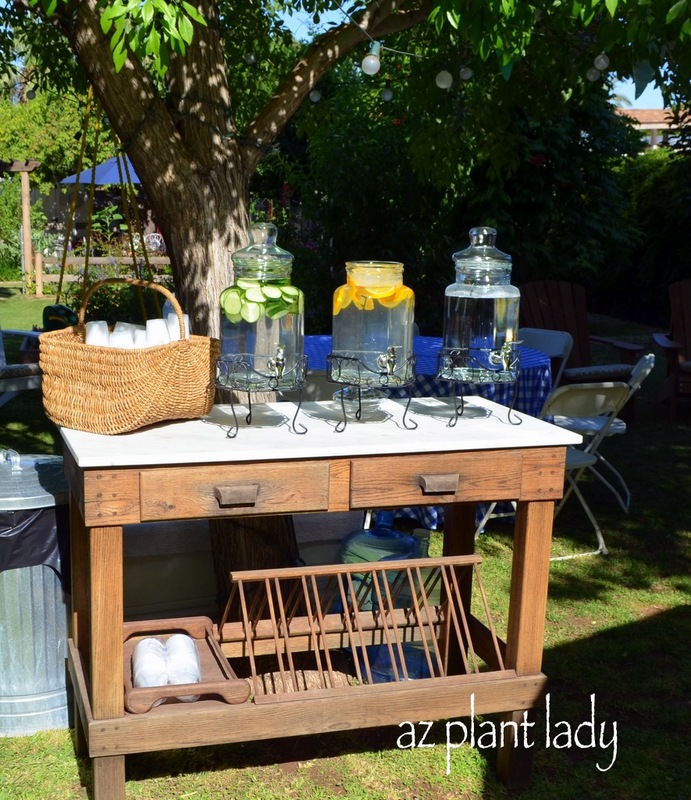 https://www.azplantlady.com/wp-content/uploads/2011/08/DSC_000003.jpg 640 576 arizonaplantlady@gmail.com http://www.azplantlady.com/wp-content/uploads/2018/10/favicon.png arizonaplantlady@gmail.com2011-08-09 16:28:002016-10-26 14:36:36Time To Plant Vegetables Already?